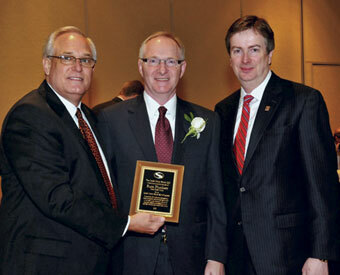 Russ Plunkett, president/CEO of Postal Credit Union, Woodbury, Minn., has been inducted into the 2012 Credit Union House Hall of Leaders. Plunkett was among 13 credit union leaders honored by Credit Union House LLC at its annual meeting last month in Washington, D.C.
Russ Plunkett, center, inducted into the CU House Hall of Leaders. With him, from left: CU House Chairman Charles Elliott and Mark Cummins of the Minnesota Credit Union Network.